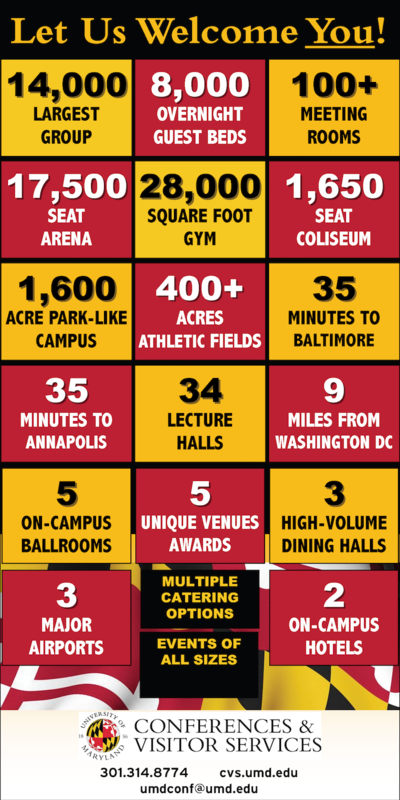 University of Maryland, College Park Conference and Visitor Services, Let Us Welcome You! When planning a corporate or group retreat, it's not just about having nice accommodations or a good AV system (though obviously you'll need those); it's about the whole experience! After all, what good is a retreat that offers fine dining and a beautiful room, but leaves you bored to tears between presentations? You could go to meetings and spend evenings watching TV at home! That's why the best venues offer on-site activities, a coordinator who will arrange your group's visit to local attractions or both. The Camp Berachah Conference & Retreat Center is one of the newest members to the Unique Venues portfolio. They offer lodging on 160+ serene acres in Auburn, Washington. Located 35 minutes away from Seattle, they have 40,000 sq feet of indoor recreation and meeting space. Onsite, guests can expect to receive personalized care, food service, and accommodations amongst a colorful canopy of Evergreen, Fir, and Maple trees. As for accommodations, guests can stay in cabins, a lodge or even a Yurt Village that offers lodging for up to 60 people. If you have a large group looking for an ideal spot for a retreat, look to Georgian College in Barrie, Ontario where you can receive a discount as well as assistance in maximizing your stay while minimizing your expense. Located 45 miles from Santa Fe, this New Mexico Truchas Peaks Place provides location for small retreats, conferences and workshops, corporate meetings or reunions and weddings. On the High Road midway between Santa Fe and Taos, and nestled at the foot of the Truchas Peaks Mountains, the facility is secluded yet easily accessible, providing exceptional meeting space and accommodations with few distractions. The ten bedroom suites are complemented by ample meeting rooms, fully equipped kitchen and dining room. Do you find yourself thinking about meetings while also worrying about new years resolutions such as health and fitness? Staying fit on the road is a concern for meeting attendees, so why not give them a location that is both beautiful, functional, and meets their fitness requirements? Hatchet Lake Lodge is the perfect location for a group getaway, family reunion, or incentive trip for corporate offices. The Hatchet Lake Lodge offers a fully equipped exercise cabin right off the boardwalk. How is it already November? November is the perfect time for corporate meetings and team building exercises to take place, especially when they include activities such as s’mores around a campfire! Luckily, our membership directory recently added a great venue with this exact amenity for group events in Colorado.